In a 5-quart Dutch oven, over high heat, cook ground turkey and onion until pan juices evaporate and turkey is browned. Add tomatoes with liquid and next 8 ingredients. Heat mixture to boiling, stirring to break up tomatoes. Reduce heat to low; cover and simmer 30 minutes, stirring mixture occasionally. Discard bay leaf. 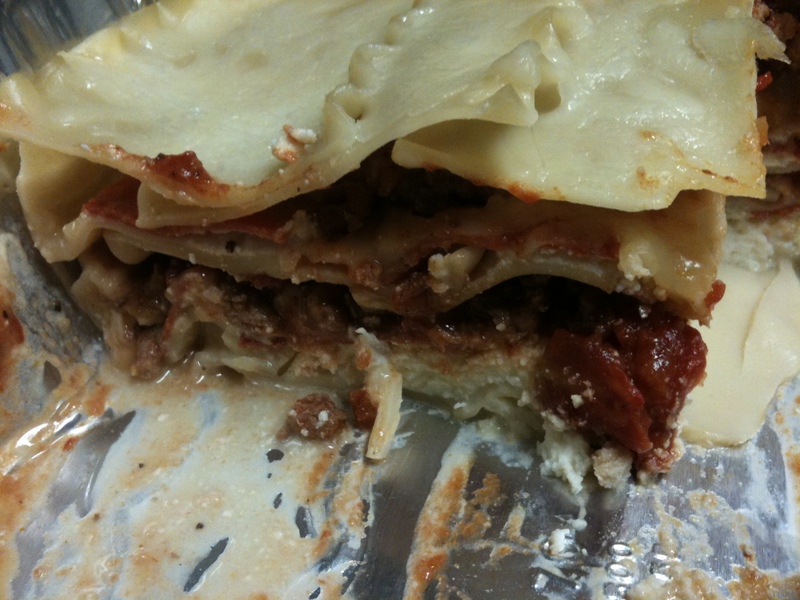 Cook lasagne as directed. Drain in colander. In 13″ x 9″ baking dish, arrange noodles, overlapping to fit. Preheat oven to 375 degrees F.
In a small bowl with spoon, combine eggs and ricotta cheese and spoon half the mixture over lasagne noodles in baking dish. Spread pepperoni over cheese. Sprinkle with mozzarella; top with sauce, repeat layers. Bake in oven 45 minutes. Remove and let stand for 10 minutes before serving.